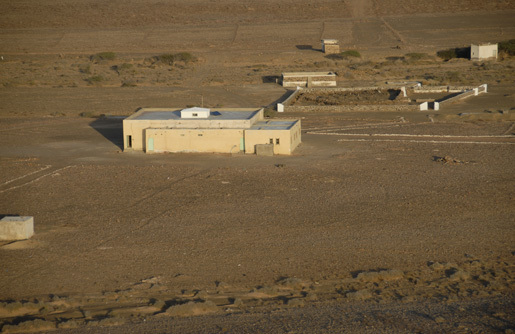 The province of Smara is located at 11 degrees longitude and 26 degrees latitude. It is also at 110 meters above sea level. The province borders the province of Tan Tan and Assa Zag to the north, Boujdour and the Mauritanian border to the south, the province of El-Aaiun to the west and the Mauritanian border to the east. The province is crossed by two main roads, the first links it to El-Aaiun to the west and the second to Tan Tan and through the last to northern provinces of the Kingdom, through Guelmim, the door of the desert. The province is distinguished by its rich historical and archaeological heritage, represented by numerous historic buildings and sites. Some of them date back to prehistoric times and other dates of the twentieth century. The strong presence of Sufi communities in the history of this province draws particular attention. This makes of it a region with great Zawyia concentration, especially on the line that goes from wadi Sakia El Hamra, wadi Draa to Ouyoune Aghman region. These Zawyia belong to the same Tarika Derkaouia community. Sidi Ahmed Rguibi Zawyia nicknamed “Moul Elhabchi », is located at 120 km from the city of Smara, on the road linking wadi Sakia El Hamra, El Batnia, Aaklat Asdam, wadi Anabat, Aaridat Umm Bedouz, El Kaa, Kaat Echbabine, Fadrat Attamat, Aljanoubi Ahab and Ahab Achamali, then Attamat which leads to wadi Al Habchi. 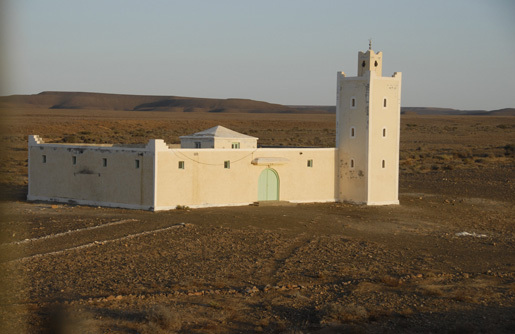 Sheikh Sidi Ahmed Rguibi was born in the year 999 of the Hegira, corresponding to 1590, in the region known as El Kharaouiaa. He died at the age of 75 years. His genealogy is as follows: Sidi Ahmed ben Mohamed ben Youssef bin Ali bin Abdullah bin Abdelkarim, bin Ahmed bin Moussa bin Ghanem, Kamil bin, bin Takmil, Zin bin Elaabidin, ben Haidara, bin Yacoub, ben Ali Well, Mazar, bin Moudar, Abdallah ben Aissa, Abdelouahed ben, ben Abdelkarim, Abdesalam bin nicknamed "Ben M'chich" bin Abi Baker, bin Ali bin Mahamed, bin Jazaa, bin Salam bin Mezouar, Haidara ben, ben Mohamed bin Idriss Al Azhar bin Idriss Al Akbar, bin Abdullah Al Kamil, El Hassan bin Al Moutana, bin Hassan Al Assibt, Ben Ali bin Abi Taleb and Fatima Zohra daughter of the Prophet. In 1888, Sheikh Maouelainin initiated the construction of the road from Smara to Terfaya to transport construction materials needed for his Zawyia in Smara. He made his son Sheikh Attaleb Khaiar responsible for overseeing this project which started in 1895. After receipt of materials arrived by sea on the coast near Terfaya, on a boat belonging to the Sultan Moulay Abdelaziz, under the command of navigator Ahmid, nicknamed the Turk. The boat also carried four craftsmen builders, from Marrakesh, Fez, Tangier and Tetouan. To these craftsmen will be added, one year later, a fifth builder coming from Oujda. Sheikh Mohamed Mustafa called by his mother at birth, Maoulainain, a title that he bore as a family name, in 1829 in Mauritania. He received his education at "Dar Salam" School and when he was 16 years old, his father Sheikh Mohammed Fadil sent him to the city of Marrakech, from which he moved to the Holy Land to perform Hajj with the children of Sultan Abdul Rahman sent by Moulay Abdul Rahman on the first steam ship linking the port of Tangier and Alexandria and then to Jeddah. 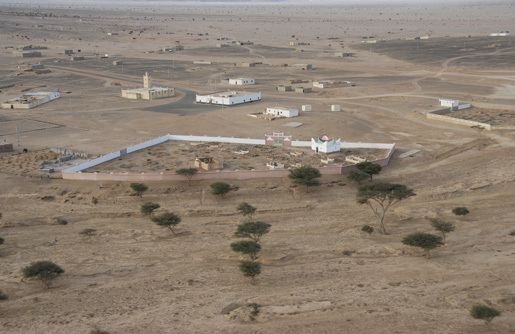 After pilgrimage, Sheikh came back to his father, who considered he was mature enough, despite his age, to disseminate the Islamic faith, by setting up a zawiya at Saguiya Al Hamra and Wed Al Dahab in order to unite all nomadic tribes, due to the brotherhood links he shared with these tribes, especially since Saharan tribes are the offspring to the same grandfather which Idris I. In 1913 French military army arrived from "Attar" in Mauritania, led by Lieutenant Colonel Moret, to attack the Maoulainain’s Zawiya. The attack destroyed the main Kasbah and demolished most parts of the minaret and the mosque. The French offensive was fierce because it was not faced with fierce resistance from tribes as they were searching for water and pasture for livestock. Some tribes moved to Guelmim and Tiznit. The Zawiya was then hosting a small number of men and students. The Zawiya of Sheikh Sayed Ahmed Moussa on the bank of Saguia el-Hamra river, between the cities of Laayoune and Smara. It is 180 km away from Laayoune, a distance of six hours, away from the town of Smara for about sixty km. It thus belongs to the territory of Smara. The region on which the Zawiya was built is famous among the Bedouin population by “Hasyat”, meaning a flat land, containing a series of plateaus, as there is no major valleys. On the road to the Zawiya , there are a lot of places and lands including first, second and third “Larmat”, “Anka” valley and then the Zawiya of Ahmed Moussa. Sheikh Ahmed Bin Musa bin Ali bin Ahmed Sheikh Rguibi, son of Mr. Ahmed bin Mohammed bin Yusuf, son of Ali, son of Ghanem, son of a Kamil, son of Takmil, son of Zine El Abidine Ben Hydra, son of Jacob, son of Ali, son of Mazar, son of Isa bin Abdullah bin Abdul Wahid, son of Abdul Karim, son of Abdul Salam, nicknamed "Bin Msheech," son of Abi Bakr bin Ali bin Mohammed, son of Jazaa, son of Salam, son of Mezouar, son of Hydra, Son of Mohammed bin Idris Al-Azhar son of Idriss I, Son of bin Abdullah al- Kamil, son of Hassan Muthanna, son of Hassan Sibt, son of Ali son of Abi Talib and Fatima Zahra daughter of the Prophet may peace be upon him. The annual meeting of Zawiya of Sheikh Ahmed Moussa, an opportunity for all his sons to gather where they pilgrimage to the Zawiya’s headquarters coming from the city of Laayoune, Smara, Dakhla, Tan Tan and Guelmim. They also come from adjacent areas. During this event, people eal camel meat, and celebrate three days by reading Quran and examine study Hadiths and Sunna. The Zawiya of Sheikh Ahmed Laaroussi is situated on Al Dahab Valley, 14 km away from the famous rock “Tbila”, where Sheikh Ahmed Laaroussi used to perform his prayers. Near the Zawiya, large number of people from Laaroussyin tribe are living semi-permanently. A modern Zawiya building was established near the old zawiya. Sheikh Ahmed Laaroussi was born in the Tunisia desert in 886. He stayed there under the guardianship of grandfather until manhood. Sheikh Sayed Ahmad Laaroussi met Sheikh Ahmed bin Yousef Rashidi Almiliani, from whom he took his Sufi practice then moved to Meknes, Morocco, where he met with Sheikh Abdel Rahman Majdoub, who taught him his Sufi practice. He then moved to Marrakesh, a center of the followers of Jazouli doctrine, where he met with Sheikh Abu Al Azm Rahal Al Kochi known as Balbudali. Sheikh Ahmed Laaroussi died in 1002 hg. Genealogy of Sheikh Sayed Ahmed Laaroussi: Sayed Ahmed son of Omar son of Sidi Moussa son of Yahya son of Hassan son of Said son of Abdul Qadir son of Saleh son of Umar son of Hassan son of Ibrahim son of Sadik son of Abdul-Karim son of Abdul Kamil, son of Ali son of Idris II son of. Driss I son of Abdullah Kamil son of Hassan Sebti son of Hassan Muthanna son of Imam Ali Fatima Zahra son of the Prophet may peace be upon him. Despite his old age, it is of great historic and religious importance to the population of Smara, as well as researchers and visitors. Smara sheikhs and those interested in the city’s history, believe that the old mosque built in 1969 by a wealthy aging Spanish, from his own money, so that it would be a place of worship, and an example of religious coexistence between the three monotheistic religions Islam, Christianity and Judaism. This evidenced the minaret which is composed of 4 circles and crescent contrary to the Islamic model which is 3 circles and a crescent. Some of its columns include ruins of the Christian cross and Jewish star. In terms of the architectural and construction method, the mosque architecture and Arabesque used show that it was built according to the Andalusian way. Construction materials include black solid stones found in the Smara region, the mosque area is 320 Square meters, expanded later to 722.84 square meters. Although the mosque in the old city of Smara is at the center of interest by the Ministry of Waqf and Islamic Affairs, which has been working for years to take care of its furniture, and that daily prayers and Friday prayers are performed regularly, howver, the city of Smara painfully remembers expansion works around the mosque which were not well studied. Therefore the mosque is now surrounded by modern buildings and shops, which undermined its autonomy and beauty. 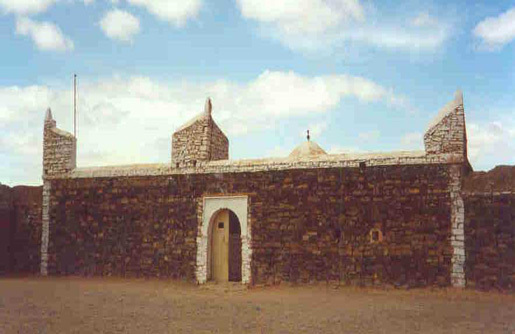 The Shrine of Boughanbour, the grandfather of people from Tidrarin is located near Boujdour, known as the people of Ziba. The meeting gathers all the tribe to a museum held every month of August. Everyone contributes by a sum of money, and people bring match sticks, sugar and tea. At the event, camels are slaughtered, and the tribe provides annual financial subsidies for the Shrine Fund.